Sea waves energy can provide with electric power many regions of the world! Numerous attempts are made to develop electric stations of different types for sea waves energy extraction. But simple, reliable and cheap power stations haven’t been designed. Ocean Power Delivery Ltd http://www.oceanpd.com conducts developments of the system (Pelamis Project) extracting sea waves energy. This system consists of cylindrical floats hingedly connected together. 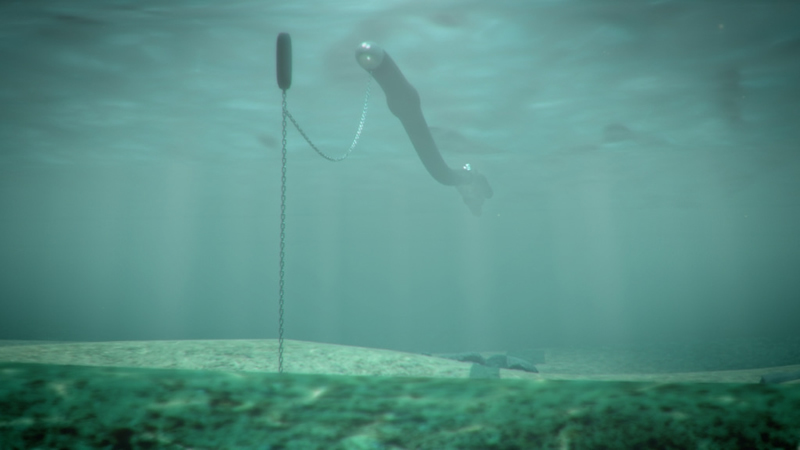 Checkmate Seaenergy Company develops Anaconda project (elastic element of a pipe type that will extract sea waves energy). 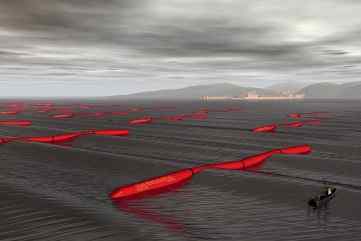 This project is extremely interesting because due to undivided working element of elastic pipe without hinges sea waves energy extraction can be considerably increased and make the construction simpler. Developments made by these companies are very important and are highly perspective. However, all these devices have a number of considerable disadvantages. 1. Now appear wind generators with elastic cylinder extracting sea waves energy with the help of elastic oscillating cylindrical bodies. 2. These generators have low energy selection ratio, complex structure and high price. - The development of these generators is conducted on the basis of using quasi-stationary oscillative hydromechanics (during oscillation stationary hydrodynamics is used). The theory of nonlinear hydrodynamics is just being conceived. Many scientists and engineers either don’t know about existence of nonlinear oscillative hydrodynamical effect or disregard it. - The development of the generator constructions is conducted using computation method of stationary mechanics. It is a great mistake. Such constructions will be complex, expensive, unreliable and will have heavy losses of energy and much harmful vibrations. These constructions have to be developed as a whole oscillating system. - Special experimental, calculation and engineering techniques are needed for these generators. There are not much techniques and experience of that kind. 3. Hydro generators with elastic cylinder extracting sea waves energy can be very effective and cheap. But we have to involve our know-how for that (to eliminate disadvantages mentioned in point 2). 4. The companies developing hydro generators with oscillating bodies should be in scientific cooperation. Our research and development works. 2. A basis of experimental results of cylinder oscillations in nonlinear oscillative mode has been formed. 3. An experimental research method of kinetic, dynamical and energy characteristics of oscillating cylinder as an oscillative system has been developed. 4. Principles of mechanical energy transmission and conditioning from sea waves to electric generator are developed. 5. Energy conversion technique from mechanical to electrical has been worked out. 6. A method and program of device calculation as a whole oscillative system has been developed. 7. Patents on wind power and hydroelectric generators with oscillating working parts (wings, cylinders, slats and other) for 80 years period have been collected. 8. Groundwork for theory of wind power and hydroelectric generators with oscillating wing has been laid. 9. Calculation method of elastic body for energy transmission has been worked out. 1. Reduction of hydrodynamical and aero-dynamical drag with the help of water -flow elements and oscillations. 2. Usage of added elasticity (elasticity caused by vortex structure of fluid body near oscillating wing). It will lead to volume increase of fluid medium participating in aero-hydrodynamical interaction with oscillating wing and, as the result, increasing of effective hydraulic square and coefficient of flow energy extraction. 3. Due to vortex structure near oscillating wing effective hydraulic square can be increased several times. It will lead to increase of energy extraction at the same wing oscillation amplitude. 2. Using of added elasticity instead of (or additionally) elastic member of the cylinder construction. It will lead to simplification and cheapening of the construction. 3. Using of special distribution of elastic and weight cylinder characteristics for conformance of external power supply with input characteristics of transmitting matching element. Due to these elements extraction of flow kinetic energy increases. 4. Usage of special transmitting matching elements for conformance of flow dynamic and kinematic characteristics with loading (power user). It will lead to matching of energy transmission from energy resource to generator (otherwise, energy will turn back to the flow). 5. Application of adaptive microprocessor control system will lead to ultimate output. Considering our results and offers, hydroelectric stations with oscillating elastic cylinders will have much better hydrodynamic and power characteristics compared to traditional ones. Hydrogenerators with oscillating elastic cylinders can reduce several times setting cost and electric energy expenses. It’s possible to assimilate production of generators suggested above from 0.1 kW to 100mW. They can be used to extract energy of sea waves. We can make research and developmental work on creation of the first samples of new highly effective technics (on the basis of our theoretical and experimental researches). We search for investors and partners for creation of the first samples of this new technics. 1. to increase efficiency of sea waves energy extraction basing on nonlinear oscillative aero-dynamics. 2. to increase efficiency of extraction, transmission and matching of mechanical energy with generator with the help of special principles and elements. In addition the device construction will be simpler, cheaper and more reliable. 3. to increase efficiency of kinetic energy extraction in a wide range of sea waves characteristics (with the help of adaptive optimal control system). 4. to produce high-power hydro generators (with working elements from hundreds of meters to kilometer in length). 1.1. Expert analysis of your hydrogenerators and working out of recommendations to improve their characteristics and construction. 1.2. Program development for processing of experimental data when extracting sea waves energy with the help of oscillating cylinder. 1.3. Processing of experimental data when extracting sea waves energy with the help of oscillating cylinder. 1.4. Calculation of geometric, kinematical, dynamic and energy characteristics of hydrogenerator with oscillating elastic cylinder. 1.5. Calculation and construction of transmitting matching elements for transmission of energy from oscillating elastic cylinder to generator. 1.6. Overview of hydrogenerator with oscillating cylinder. 1.7. Atlas of hydrodynamic parameters of oscillating cylinder (theoretic). 1.8. Atlas of hydrodynamic parameters of oscillating cylinder (based on experimental data). 1.9. Overview of wind-hydrogenerator with oscillating cylinder patents (copies of patents). 2.1. The analysis of known hydrogenerator constructions extracting sea waves energy with the help of oscillating cylinder and other working elements is given. 2.2. Mathematical and physical model of sea waves energy extraction with the help of oscillating cylinder (quasi-stationary model) is given. The comparison of theoretical and experimental results is presented. Different modes of cylinder oscillations in the sea wave are being considered. 2.3. Theory basis concerning flow energy extraction with application of nonlinear oscillative hydrodynamical processes. The comparison of theoretical and experimental results is presented. 2.4. Measuring methods and programs of experimental data with cylinder oscillating in the sea wave. Analysis techniques of kinematical, dynamic and energy characteristics of wind-hydrogenerator of oscillating wing are given. 2.5. Applications (copies of patents, software) are provided. Monograph is given in the form of a book or CD with active programs. Approximate volume is 500 pages and 600 pages of application. The monograph is meant for engineers and scientists studying research and development of wind-hydrogenerators extracting energy with the help of oscillating wing and other working elements (scientific report, approximately 500 pages with software).